I made a big mistake today. After varnishing some newly finished figures I had a close look at some of the very first figures I'd painted for my Timurid/Islamic Persian/Moghul project. 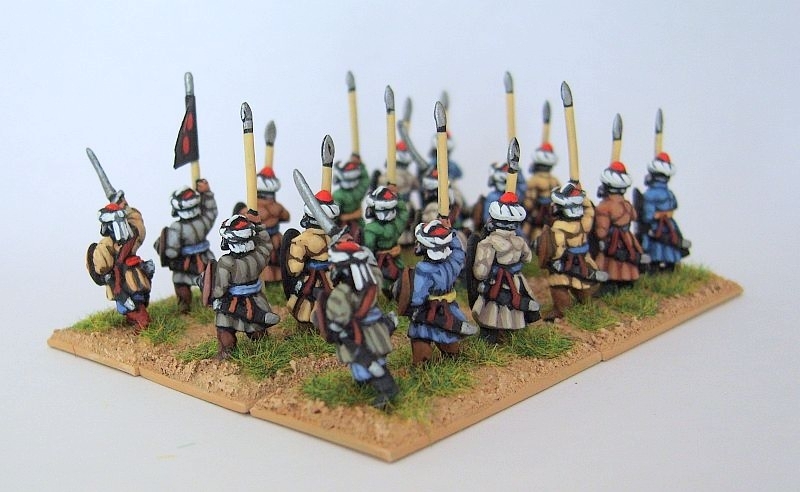 In particular, I looked at the Afghan spearmen (May 2009) and some late medieval handgunners for the Timurids (of a similar date). They've been sitting happily in their toolbox waiting for the rest of the lead pile to join them. I have to say I wasn't impressed. In Dec 2009 I bought my magnifier so looking at these pre-magnifier figures was a shock. The edges of the main block colours were untidy and the highlights were high contrast and "stripey" to boot. On some figures my painting was just plain awful. I certainly wouldn't paint them like this today. I know I was struggling to see figures properly for a while before I bought the magnifier but I didn't think it was this bad. My failing eyesight explains the lack of control and neatness. I must have been over emphasising the highlights to compensate as well. If you look critically at the photo of the back of the spearmen you should see what I mean. Anyway, and to cut a long story short, they've all been re-painted; just the coats and jackets mind you. They now have a neater block colour and a more muted highlight. To speed up the process I used Flat Future to seal and varnish the figures which worked like a charm. On the positive side it didn't take that long and they now are a closer match to my current style. The magnifier has obviously improved the quality of my painting and I suspect that in the last five years my style has improved too. I know that in the last couple of years I've been making a conscious effort to highlight with a colour just different enough from the base to be seen clearly and no more. The moral of the story is never look back. I have a dream to paint an army to my best standard and put in on a game table sit back and admire, problem is my style evolves so often if I every cam near to this the last figures painted would not exactly match the first. Also as the painter you know any errors and they are the first part you see on the figure, it would be so great to be able to look at your figures with the eyes of a stranger and enjoy them for all that is good on them and not that one tiny error that only you know is their. I agree dont look back.